Way back in November, we wondered whether John Tortorella's decision to scratch Sean Avery from the lineup in last year's playoffs had caused Avery to lose his edge this season. And, given the infrequency of games in which he's demonstrated that edge this year, that still may be true. But his most recent removal of Avery from the lineup — for Friday's 5–2 win in Atlanta — proved to be quite effective. Avery scored twice in yesterday's 3–1 victory over the Flyers, which closed them to within one point of ninth-place Boston (though the Bruins have two games in hand). Avery's influence on yesterday's game went beyond the score sheet, as it tends to: He drew a penalty in the second period by absorbing a punch from Scott Hartnell without retaliating, then drew another a period later on Braydon Coburn. Unlike when Avery sat in the playoffs last spring following some bad penalties against the Capitals, his crime this time was less specific. In Tortorella's words, he was "not engaged enough" of late in "all facets" of his game. This lack of specifics was probably for the best: Unlike last year's playoffs, this didn't leave Avery to figure out what he was and wasn't allowed to do under Tortorella. This time, the message was essentially "Just play better." 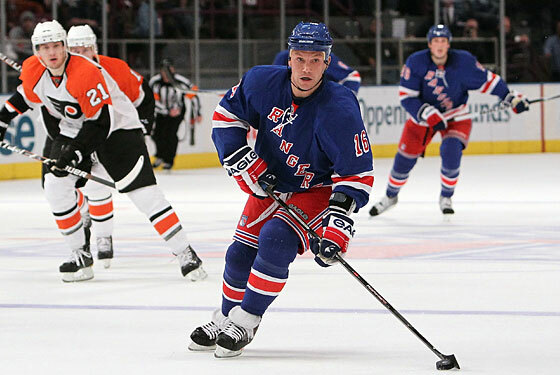 As should be expected when they play the Flyers (especially after the Daniel Carcillo–Marian Gaborik fight earlier in the season), the Rangers played a physical game. But the Flyers didn't (or at least, not a disciplined one), despite using an especially tough lineup that included Riley Cote, who'd been a healthy scratch for 33 consecutive games until yesterday. Only Mike Richards dropped the gloves (with Brandon Dubinsky), and did so late in the third period, ending his day when his team was still within striking distance. But if the season comes down to the last weekend, make no mistake: It'll be a bloody good time.